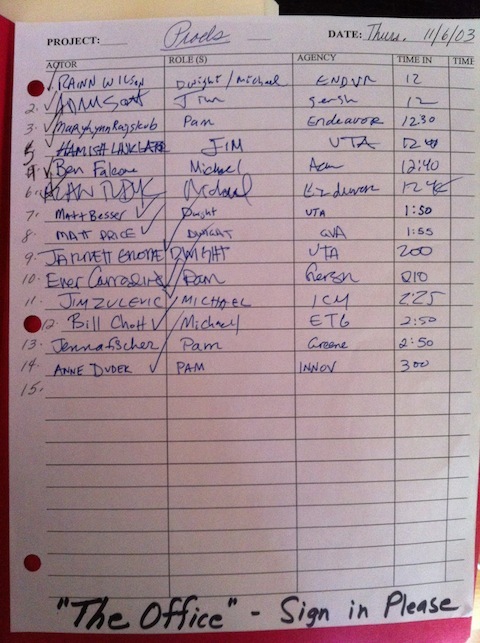 The above image was shared by Rainn Wilson and is the original sign-in sheet for the first day of casting for The Office. With the series wrapped and the final episodes scheduled to air as spring approaches, now seems like a fitting enough time to look back on what has and what could have been. The sheet not only shows us that Rainn Wilson was the first person to audition for the series, but also some of the other people who were up for roles. Alan Tudyk as Michael Scott? It's hard to imagine anyone playing Michael Scott better than Steve Carell, but it's not difficult imagining Tudyk in that kind of role. The Firefly and Suburgatory star has always been good with comedy. Imagine, The Office might have been Tudyk's first big post-Firefly role… excluding Steve the Pirate in Dodgeball, of course. Also up for the role of Michael was Ben Falcone, husband to Melissa McCarthy. Around that time, he was playing a role in NBC's Joey. More recently, he appeared in Bridesmaids, and we'll see him in The Heat later this year. He would've been a different Michael, given his knack for comedy, who knows how it might have turned out? Anne Dudek and Marylynn Rajskub as Pam (Jenna Fischer)?! While her credits were minimal around 2003, with and episode of ER and a role in a British series called The Book Group under her belt at the time, Dudek has gone on to play a number of notable roles since not playing Pam in The Office, including Amber in House, Francine in Mad Men and Lura in BIg Love. Mary Lynn Rajskub played Chloe on 24. In fact, the series was still airing during the time of her audition for The Office, which makes me wonder if either the Fox show or her character was in question at that point, or if she was simply looking to explore more comedy, in which she has a prominent background. Can you imagine 24 without Chloe? I don't want to. But I do sort of love the idea of Rajskub as Pam, perhaps in some bizarre alternate universe where Alan Tudyk is Michael Scott. As for Jim, if things had worked out differently, the role might have been played by Parks and Recreation's Adam Scott, whose past credits at the time was a recurring role on Party of Five and a role in a show called Wasteland. After not playing Jim, he took a series of roles in film and television, including a one-episode spot in Veronica Mars as the accused teacher Mr. Rooks. We saw him as the male nurse in Knocked Up and he eventually won many of our hearts every time he asked if we're having fun yet in Party Down. Gideon's Crossing's Hamish Linklater was also up for the part of Jim, but as we know, John Krasinski won the role, and Linklater went on to play Matthew Kimble in The New Adventures of Old Christine. As for Dwight, while it's impossible to imagine anyone but Wilson playing the part, it might have been Upright Citizens Brigade's Matt Besser, whose recent credits include Parks and Recreation, or Matt Price, who ended up appearing in Arrested Development as Agent Freeling, and playing Lawrence in Men of a Certain Age. Things worked out for the best, obviously. The Office has aired since 2005 and the core cast was perfect. But it's still fun to imagine what the series might have been like with different actors in the leads, and just how drastically it might have affected the show. Here's the caption included with Wilson's post. This is the original sign-in sheet for the first day of casting for The Office given to me by Allison Jones, our incredible casting agent. I was the very first person to audition for the series, 11/06/03. Notice all the amazing talent on the sheet, including the amazing #13! This is perhaps the greatest Office keepsake I have. So grateful for the best job I will ever have.